“I was able to have confidence in my leadership style thanks to my team members,” said Kazuki Kokubun, participant of the TOMODACHI Generation Global Leadership Academy 2016. The Academy enabled the TOMODACHI alumni who are from Tohoku to experience and witness the power of teamwork and learning from one another. 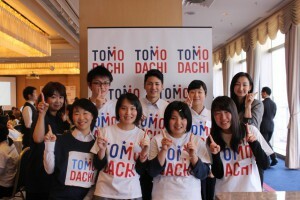 Nearly 60 alumni representing 12 TOMODACHI programs participated in the TOMODACHI Generation Global Leadership Academy, which began on March 4th 2016 in Tokyo. 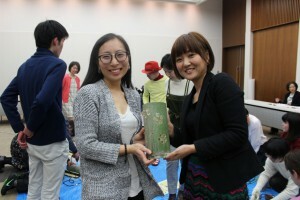 The Academy aimed to provide an opportunity for students to not only look back on the past five years since the Great East Japan Earthquake, but to also think about how they can stay connected and committed to their communities for the next five years, to 2020. The Academy focused on the overall theme of social innovation and three topics; education, entrepreneurship, and technology. The three-day academy was comprised of multiple workshops, speaker sessions, career night and lunch reception that included final presentations by each student group. This program is supported with generous funding from Bank of America Merrill Lynch. 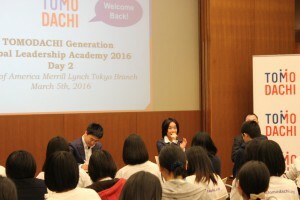 On March 3, 2016, prior to the start of the program, student leaders and mentors met for the first time at the Bank of America Merrill Lynch offices in Tokyo to discuss their leadership styles and how they hoped to execute these over the next three days and took part in an ice-breaking activity facilitated by the Chikaken Takeakari Project. The following morning, high school students arrived from Tohoku. 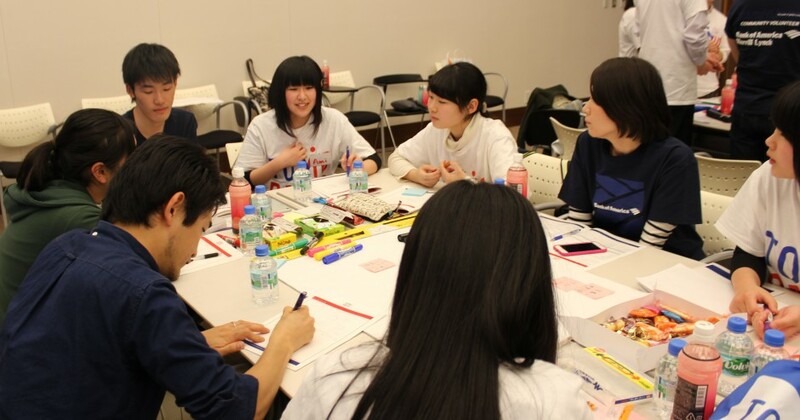 Students from the Iwate, Miyagi, and Fukushima prefectures were split up into nine groups according to their region. Brainstorming for an action plan was soon underway, with the day’s discussion focusing on the various events and projects that had sprung up in the participants’ communities in the wake of the Great East Japan Earthquake. In the evening, the high school participants were given the chance to hear about their mentors’ various career paths as they dined at the Bank of America Merrill Lynch Café. 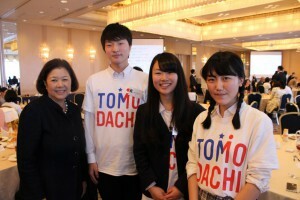 During the evening, students attended the ‘Japanese American Career Night’ where they met U.S.-Japan Council President Irene Hirano Inouye, who spoke about her experiences as a Japanese American and what led her to become the leader she is today, particularly in the Japanese American community. The evening was led by TOMODACHI Emerging Leaders Program (ELP) alumni Evelyn Tokuyama and Steve Sakanashi, and brought together Japanese American young professionals who each shared their own unique experiences with the program participants. The third and final day of the program was a lunch reception held at Haneda Airport’s Galaxy Hall. 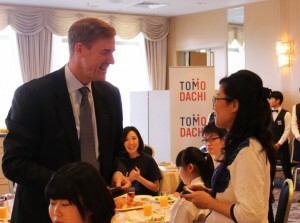 This was a big day for the students, for whom the three days of intense debate and discussion had been leading up to a presentation in front of many guests who are continuing supporters of the TOMODACHI Initiative. After hearing remarks from Irene Hirano Inouye, Mrs. Marrie Y. Schaefer (Press Attaché, U.S. Embassy Tokyo), and Mr. Timothy Latimore (Japan Country Executive and President, Bank of America Merrill Lynch), and a video message from Mrs. Akie Abe (wife of the Prime Minister of Japan), the nine teams presented their action plans.